“Let the Plan of Love and Light work out. Djwhal Khul who wrote this explained that the evil of concern here is not the standard group of evils seen by most, such as greed, pride, robbery, plunder etc. Certain abuses will be with us in some degree for some time to come. What concerned him was an evil that would affect us all by taking away our basic freedom of thought and action. This was a door opened by Hitler and his associates. If they had won the war the world would be much different and enlightened teachings would not be allowed to be circulated. The door to this evil of suppression had to be shut and the Allied victory in World War II almost did it. Since then a number of forces in the world have pushed it partially open such as the Totalitarian threat from the old Soviet union, The present threat from North Korea and extreme Muslim factions who want to impose their will upon the world. The rising generation will have their hands full in shutting that door so freedom in the world can continue to grow and flourish into a new age of light and truth. Even though the evil that concerned Djwhal Khul was a particularly dangerous and sinister one, like any inspired writing the interpretation can be applied on several levels. We as individuals can open a door to both good and evil into our lives. Which door we open depends on what type of food for thought we allow to enter into our mind and thinking. If the focus is to the extreme toward material possessions then the tendency may be toward deception, unfair practices and even robbery to get what is wanted. If the focus is on the spiritual side, such as love, wisdom and compassion then the tendency will be toward service for fellow humans. We may not know all the ingredients of the Plan, but we do have some grasp of what love and light is. Almost all the harm that one human does to another is from a lack of love. If he could feel the pain he is inflicting on another then he just wouldn’t do it. Loving our brother as ourselves causes us to feel what it is like to be in his shoes and thus treat him civilly. When a person harms another he does his best to remain in the dark. The thief or murderer, for instance hides his identity. If the person with harmful intentions always had all his actions exposed to the light then he would rarely do them. Thus we see that love and light shut the door to evil so it cannot fully manifest. If all the people of goodwill did their part then neither a greater or lesser door to evil could remain open. Just think of the Plan as “peace on earth, goodwill to men” – and of course women. Ask yourself how you can do your part and contribute to light and love? And where does power enter in and what is its source? Students often overlook the word “restore” in this line. If the Plan is to be restored this means that it was once here and moving forward. On the other hand, the fact that the Plan was once here does not mean that the Plan was ever consummated. In other words, the Plan and the results or finishing of the Plan are two different things. The Plan is like a blueprint for a house, but it is not the house. In this case if you have the plan you have the blueprint and know what to do to go forward with the creation process. This line therefore tells us that humanity once had the correct Plan and was moving forward with it, but apparently something happened to obscure or frustrate it, maybe something that is symbolized by the fall and being cast out of the Garden of Eden. So the work of disciples for some time has not been to implement the Plan, but to uncover it. Then when the Plan is revealed and understood real and efficient progress can be made. Interesting thought is it not? When interpreting any text the seeker must not overlook any word. Often an authority will quote a sacred text and explain it and miss a key phrase or word – as if it does not exist. Those words that are ignored by the many often come full of meaning to those who have eyes to see. So, we want the Plan restored so we can have a lighted way and no longer be groping in the dark. What then will restore the Plan? The answer given is Light and Love and Power. And previously we discovered that these three energies must work through humanity itself in order to make this happen. We see that a Plan exists, but is obscured and the first step in making it visible to humanity is Light. We can’t just sit around waiting for God to send us light, but light must come from us. Each of us must do our part. We all have some desire for more light and understanding. It is our duty to seek and expand that light until each of us is an expanding point of light. Then as the light within does expand it is our duty to share that light with others. When the light that is in humanity is great enough we will have the united vision to be able to see the Plan when it does manifest. The second ingredient is love. If we fear the Plan of God then we will not want to see it, but if we love words of truth and have faith that we will love that which out Heavenly Parent has in store for us then both light and love will move us forward toward – seeing and understanding the Plan. Since “God is Love” we can assume that the Plan will be interwoven with love and that loving our brother and humanity itself will do much to manifest the Plan. The final ingredient is “Power.” What part does this play? Many there are who seek greater light and love to serve, but lack the power. The cares of the world take so much if their attention that the light and love in them almost becomes dormant. The seeker, as well as humanity itself, must acquire enough power to free up the light and love which is essential to reveal our next step as well as attract us toward it. Sources of power are many and none should be discounted. They include power from the soul within, power from helping hands and power from money that can free the hands of a working disciple. That finishes the use of The Great Invocation as a source of seed thoughts. We have just skimmed the surface of what could be revealed. Each seeker should memorize this and say it regularly and as he does he should contemplate the words for additional light. You never know what your soul will reveal to you. Think on this and see what comes to you. The seed thought for the day was a short one, but sometimes a few words lead to much knowledge and understanding. Were you able to figure out some questions to ask about this? Were you able to expand on meaning? Notice that the word “Path” is capitalized as are words related to Deity? Why do you suppose this is? The answer is that the Path is a link between us and God and when clearly seen we discover that the distance between the two is illusion. In reality then there is no Path as the term is commonly understood. The Path home in a sense is not needed because the real part of ourselves has never left and we are already there. Looking for the path is a little like being asleep and looking for a path to find your waking self. Since the dream was created by you then you would find that your very thoughts are the Path. You just follow your thoughts to the end of the dream and then you awake. The path then can be whatever you make it for when you are finished with the illusion you will merely wake. To discover what a separation from our true home would be like we projected a fragment of ourselves into the worlds of form which are created on the principle of illusion. Jesus said that He and God were one and told us that we should see ourselves this way also. If, therefore, the Path to God is made by God, it is also made by you. As long as we are in the world let us create wonderful path – one that leads to love, peace, joy ad happiness. That is what is at the end of the dream, and when this becomes a part of our own creation you will wake up to a higher reality. Don’t worry if you did not get the same insights on this thought as I did for there are many to be gleamed and it is quite possible you may come up with something different, yet helpful for yourself. We’ll do one more seed thought and then move on to other material. There are a lot of questions that you could have asked yourself around this thought. I hope you found a few and contemplated on the answers. A key word on which to place attention here is “light.” It would be advantageous to reflect on this before going further. When the average person thinks of light he thinks of the world around him and how it is illuminated. The most obvious light is that of the Sun which lights up the world and allows us to see the beauties of this planet we call Earth. Until recently any significant light by night was inadequately created by a burning fire such as a candle or torch. Now in the modern era the earth is lit up at night through electrical lighting. Nighttime pictures from space reveal a tremendous amount of light on the dark side of the planet. If we had similar pictures from a couple centuries ago the night side of the planet would have been totally dark, as it was for thousands of years before electric lighting. Light is basically that which reveals, and to reveal, contrast is needed. Before the Sun’s light reaches us it travels through 93 million miles of space in which nothing is revealed because there is no contrast until the Sun’s rays strike contrasting forms here. It is interesting to consider that an astronaut in space can look in space that is being bathed with the Sun’s rays yet he sees no light at all, but only blackness and stars. Light does not reveal until there is something with contrast that can be revealed. Science has discovered that the frequencies of light that are in the visible spectrum are just a small portion of what is out there. Vibrating with a lower frequency are infrared light, microwaves, radio waves and others. At a higher frequency we have ultraviolet, X-rays and gamma rays. The range of light belonging to the physical plane is marvelous indeed, but there are still higher types of light on higher planes. In the higher plane wherein resides the soul is a kingdom permeated by a light of a different nature. In addition to revealing all that regular sunlight does, it stimulates understanding. Understanding increases as the light of the soul shines on the mind and is captured by the consciousness of the individual involved. Understanding is not usually associated with light, but when reflected upon the seeker will discover that the link is very strong. When the mind receives the higher light of the soul and the consciousness pays attention understanding is greatly enhanced. Remember light is that which reveals. When sunlight shines on an apple we may see its form. When the inner sun of the soul shines on the mind the seeker may see or understand an idea and how to apply it. The principle of revealing is the same for the two lights; it is just that they reveal different things. Your Higher Self is linked to still Higher Lives which are linked to God and can channel to you all the light and understanding that you are willing and able to handle. The mind is the key to receiving the higher light and the heart is the key to fully understanding and applying what is revealed. Your assignment today is to focus on looking within for the higher light. 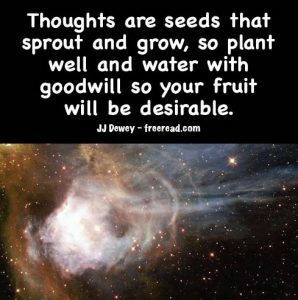 Review all the seed thoughts given so far at your disposal and see what additional light and understanding will come. Tomorrow we will direct the course toward contacting your Higher Self. We will leave the seed thoughts for now but will return as needed. When we think of communion with the soul or Higher Self we normally think of receiving impressions, the still small voice or inspiration from an inner source higher than ourselves. All these methods are good and the seeker should expand upon them as much as possible. Often unrealized is that the Higher Self, at least from our point of view, is basically unlimited. There are no boundaries as to how it can communicate with us if we are willing. The only restriction is that the communication must be a two-way endeavor. The seeker cannot just sit back and let the Higher Self do all the work. Neither will your Higher Self leave everything up to you. In the end you are one, the reflector and the reflection. All communion is cooperative. A difference, however, between you and your Higher Self is that this higher part of yourself is much more aware of you than you are of it. Before it can respond to you, you must evoke it and call upon it. Many do this to a degree naturally through prayer. In prayer the person calls upon God, but your Higher Self is linked to God and if potent enough will receive your prayer. Similarly meditation can evoke response from your Higher Self. One of the most important pieces of knowledge for the seeker to have is that there is a higher part of himself that is the intermediary between him and God and that it is happy to make contact. As mentioned earlier, there are many distractions and illusions that take away our attention from the true spirit within and place them on the gods without, but when the seeker finally looks in the right place he can indeed seek and find. An important key to greater knowledge of your Higher Self is that it has a name and just like you respond to your name this entity responds to its name. The assignment today is to find the name of your Higher Self and call upon it. “And how am I supposed to do that?” asks he seeker. The simplest way is to just ask what its name is. Those who ask who are sensitive may get an answer right away. Some will think they have the right name but really have an incorrect one. Others will just not feel sure if they are getting anything or not, How, then, can seeking the name be useful to a group if many do not retrieve the correct name? His answer is this. The Higher Self will be pleased if you do discover and use the correct name, but is still happy to respond to you even if you get it wrong. The most important thing is to tune in to its essence and call upon it by a name that feels good to you. Here is the process to apply. First consider that your Higher Self may have the same, or a similar name, to our own. Sometimes parents will tune in to the Higher Self of the child and use a similar name. Then sit in silence for a few moments and listen. After discerning the name to the best of your ability pick the one that feels most correct, even though you may not be sure that you are right. Pick a name and start using it, calling your Higher Self by name as if it were right next to you. As you proceed and another name comes to mind that seems better switch and use that. The important thing right now is to pick a name that feels good and begin using it. Keep the name to yourself and do not tell anyone, unless you feel impressed from within to do so. We will explore using the name in the next lesson. Some will be concerned about naming the Higher Self when they are not sure they are correct, but the important thing at this point is to pick a positive sounding name. We are taking a step, and the step involves moving forward, which is more important than being assured you are 100% correct. So wouldn’t your Higher Self be offended and unresponsive if you called It by the wrong name? The answer is no. To understand let me ask you this question. Have you ever had a nickname, or known someone who did? As long as the name sounded positive then using the name was no problem was it? If one has a good nickname he will respond to it just as he would his real name. Sometimes a person will like his nickname more than his real name. “Babe” Ruth is a good example. His real name was George, but he has no problem embracing his handle. Theodore Roosevelt didn’t like the nickname “Teddy” but did like a lesser-known one of “Colonel,” so those who wanted to get on his good side used that. During president Franklin Roosevelt’s era the initials of his name, producing the nickname FDR, became more popular than his real name. Since the higher part of yourself is less subject to taking offense than you then giving it a name will be no problem as long as the intention is positive. So, if you have not received a name and do not want to use your own what should you call the Higher Self? There are a lot of possibilities. You could call it Jesus or Christ, or Jesus Christ since it shares in the Christ consciousness. In fact many revelations where seekers feel they encounter Jesus are merely encounters with the Higher Self. If you are into Eastern religions you could pick Buddha, Zoroaster, Krishna or some other hallowed name. On the other hand, you could pick a common name such as Tom or Bill, or Mary or Susan if the female side is preferred. Any name will work as long as you see the name in a positive light. The important thing is to pick a name and start using it with the realization that this represents a higher part of yourself, which is linked to Christ, which is linked to God. This is your personal Christ who is willing to assist you in creating miracles in your life. So, if you have not yet picked a name do so now and remember you can change your mind later if a better one comes along, or if the true name is revealed to you. Do not change the name without good reason, as the thought you will be placing on it is cumulative and an important reservoir of energy. Did you say the name 100 times during the last day? Unless you are one of the few, probably not. If not, you have by no means failed, but merely not completed the assignment. Continue to say the name over and over until it feels like you have done it 100 times. Do not keep any actual record of the count as that would merely distract. During this coming day attempt to be more diligent and remind yourself about the name and be sure to sense and anticipate an inward response. If you have finished the assignment as specified continue contemplating the name, but without the repetition. Just think on the name and attempt to feel the presence. Your assignment today is an extension of yesterday’s. We want to take this step before proceeding. How are you doing on the name? Have you gotten to around a hundred yet? Does the name you are using feel right or does another name that came to your mind feel better? If so, go with the one that settles best with your own inner feelings. When you settle on a name you’ll know when you have said it enough times. If you haven’t repeated the call enough yet, go ahead and continue during the next few days. In the meantime go ahead and move forward to this new lesson. Settling on a name for your Higher Self and calling on It with an expectation of response is a solid and bold step to take. It shows that you have faith that there is some type of higher intelligence connected to you that is capable of response. As you continue working on this link we will take the course to its next level. So far you have been attempting to use your higher feelings to sense the presence of your Higher Self. This you should be doing whenever you think of it or call out Its name. Next we must add vision to the equation. The problem the seeker faces is that just as he may not have known for sure the name of his Higher Self he may have no idea what it looks like. Just as you did not know for sure what name to use, you probably do not know what to envision when selecting an image. That doesn’t matter and this is where the power of your imagination comes into play. There is an eternal principle which tells us that “energy follows thought.” If you therefore imagine with enough intensity a form that represents your Higher Self the energy you place in that form can draw your actual Higher Self to it. The key is to make the image a positive representation, just as you tried to pick a good sounding name. For the image you can choose a benevolent elderly man with a beard – as many imagine God to be, an image that looks like Jesus, some ancient sage, a benevolent and beautiful female or even an historical figure you admire such as Abraham Lincoln. You can even pick an image of yourself – after all, we are taking about a higher part of you. A final way to make the choice is to meditate on what the image should be and see what comes to your mind. If an image comes and it feels right then go ahead and use it, even if it is a ball of light. Reflect and come up with a picture in your mind that represents your Higher Self. Now sit back in your chair and imagine that it is standing several feet in front of you. Imagine that you can see It with your eyes open or shut. Now call It by name and imagine that He or She recognizes the name, smiles and is willing to respond. Call out the name several more times and imagine that it makes a connection with you that allows you to sense Its thoughts and feel Its love. This is as far as we will go today. See your Higher Self, call to It and feel It giving you a response. Repeat this as often as you have time. So, did you make a connection with your Higher Self? Were you able to visualize It? Did you sense Its love and acceptance of you? If the visualization was not clear do not be concerned. Some people are better visualizers than others. We all develop various skills where we place attention. The important thing is that you sense the higher presence. If you have difficulty visualizing a human form perhaps seeing a burning bush as did Moses would be easier. There is much more power in thought than is realized. Your presence here in a physical body was made possible by thought. The thought from your own soul in cooperation with other lives helped prepare your body that you currently use. By visualizing, or even sensing the presence of your Higher Self you are following the same basic process as have all creators before you. The only difference is you are at beginning in the learning of this process while others in the unseen world are master craftsmen. If you will imagine a presence not far in front of you who is willing and able to communicate with you, then you are applying the beginning steps in the creative process and can actually create a vehicle of manifestation for your Higher Self. Each time you see or sense your Higher Self near to you, you are sending a charge of energy by the very power of your thought. Each charge is a building block that can create a usable vehicle that can be of service to your Higher Self. You will most likely not put all the blocks together in one or two lessons. You must realize that this is just the beginning. You will want to practice this process for the rest of your life. If you are diligent you will be rewarded with the presence of your best friend, a higher and more perfected version of yourself. (1) Have I lived up to your expectations in this life? (2) In what areas do I need to improve? (3) What am I supposed to do with the rest of my life? Ask these questions with a sincere heart knowing that the Higher Self is here to help you and does not condemn you, but accepts where you are in the struggle of life. Expect an answer. The stronger the expectation the more likely it is that you will receive. How did you do with the questions that you asked of your Higher Self? Did you receive any answers? A handful will receive answers that seem clear to them. Most will not be sure, but if it seems you received no response do not discount your endeavor so quickly. You may have received more than you realize. After all, communication with the realm of the Spirit is much different than person to person on the earth. Now you can’t tell me that nothing came. When you asked the question some type of impression came to you. The chances are you thought that it was all from you and not your Higher Self. You must remember that you and your Higher Self are one. The only difference is that you are a fragment in an illusionary dream state and the Higher Self is an awake version of you. Therefore, that impression that came to you when you asked the question may not be that far off. Because we are usually our own strongest critic you may have at first felt that you are not living up to all that was expected of you. Then, when you thought about it, some of the things you have done right probably crossed your mind. It is indeed true that all of us have had successes and failures. It is good to reflect on life in connection with the highest of spiritual intelligence you can access. Upon reflection you are likely to receive helpful impressions from your Higher Self that will improve your life. To this all kinds of things may have run through your mind and you probably thought they all came from you and you alone. On the other hand, one of those things stood out more than others. This was most likely an impression from your Higher Self. You might want to ask this question again and observe all that comes and take note of the one where you receive the strongest impression and think on it further. A few are satisfied with an answer to this question, but many are not. Many are not sure if they are headed the right direction and would appreciate some guidance on this. Many have prayed to God about this and still are not sure. Similarly, many who will ask his of their Higher Self for the first time will feel that they have not gotten a clear answer. Find something you enjoy doing, preferably something that will benefit others and do it. As you go through this process you will sense when you are headed the right direction. All of us have an internal compass and if we pay attention to it our life will head in the right direction. Follow the highest you know and the time will come that you will receive a recognizable confirmation from your Higher Self. It will most likely come in an impression or strong feeling that you are headed the right direction. Working with your Higher Self and seeking communion with It will be a life long endeavor. These lessons pointing you in this direction are merely the beginning and far from the end. Visualize, or imagine the presence of your Higher Self regularly and take note of your increased sensitivity as it comes. Your assignment today is to again visualize or imagine the presence of your Higher Self and formulate a couple questions on your own. Keep experimenting with imagining the presence and communicating with it. You will find that energy follows thought and turns the imagined into the real.